Well, I did it. 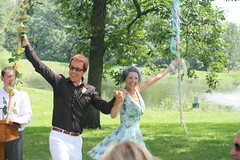 I got married July 31. Officially and legally and in front of lots of family and friends. It feels great. 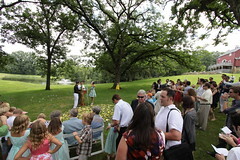 The wedding was a whirlwind – so many people we care about all together in one place. I felt like a kid in a candy store. It’s been about a month since it happened and I am still a bit overwhelmed by the whole experience. For the most part it went perfectly – We didn’t stress too much, things went as planned, we had gorgeous weather, everybody had a good time, what more could we want? Our really close friend, Juan, was our officiant (yay), his first. Shayna and I wrote and read our own vows to each other then immediately after the ceremony ran off to the woods for a few mins to absorb what just happened. It was very special. I was really happy that so many of family and friends could make the trip. Most of them are not from the midwest and were like .. where is Galena? But Oak Hill was a perfect choice for a wedding venue. Shayna’s family and my family really hit it off – altho the parents did meet back in March of this year, so it was not there first encounter. In fact, everybody hit it off. Our picnic theme really brought everyone together – we had BBQ and games like badmitton, croquet, bocce ball, and bags. Plus our guests are all cool and awesome and there’s no way they wouldn’t all become best friends. The honeymoon was fantastic, too. I’ll spare you some of the personal details and just tell you how awesome the midwest is. 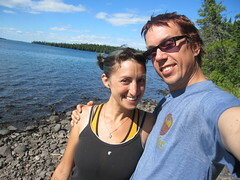 Basically we took 2 weeks off after the wedding to go camping on Isle Royale National Park in Lake Superior, hitting bed and breakfast joints before and after. It’s about an 8 hour drive from Chicago to Copper Harbor, Michigan, where we had to take a 3-4 hour ferry to the island. Our room at copper harbor was one of our favorites of the trip – the crow’s nest at Harbor Haus restaurant was a giant round room with gorgeous views of the water. And the food at Harbor Haus was some of the best I’ve had in the midwest – I loved their rack of lamb. 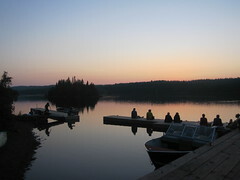 We spent 6 days on the island, 4 nights camping and the last night at the rock harbor lodge. Shayna was a real trooper, pushing hard and not slowing me down, even though this was only her second backpacking adventure. Yes, thats right, we backpacked. We carried all our food and gear that we needed for 5 days on our backs. Well, we did eat sweet wild raspberries that we just picked off of bushes along the trail. But the rest we brought with. The island has an amazing yet serene beauty. As a national park there is verly little development on the island. Except at the 2 harbors (where this a lodge, restaurant, gift shop and general store) there is nothing – no cars, roads, bikes – nothing but boats, canoes, and backpackers.. and wildlife. We hoped to see moose and wolves, but saw birds, rabbits, squirrels, a fox, a giant owl, a bald eagle .. pretty good, actually. We mostly hiked but also swam (I loved dunking my head in the clear, cool, refreshing lake) and canoed (Shayna loves canoing) in Lake Superior. After the island we hit door county, wisconsin. It’s a small peninsula in lake michigan with a bunch of cute harbor towns that’s been compared to old towns in new england. Our other favorite room was at the Black Walnut B&B in sturgeon bay, the big town in door county. Our favorite meal (except harbor haus) was at the cookery, in fish creek, one of the many cute small towns. Also, on the last day, we decided to take a detour and hit the New Glarus Brewerey (mmm.. Fat Squirrel) in the cute little swiss-german town of New Glarus, Wisconsin. We enjoyed tastee beers then decided to spend one more night away from home. Lots of fresh beer had nothing to do with that decision. Yay. But not all our friends could make it to the midwest, so we are celebrating with them in California on September 18, cali style. We reserved a resort in the mountains with cabins, camping, swimming pool, music, and lots of shenanigans. Looking forward to that ! !